Korean pumpkin porridge with rice dumplings – its best to serve for breakfast, they call it as hobakjuk in the Korean language. 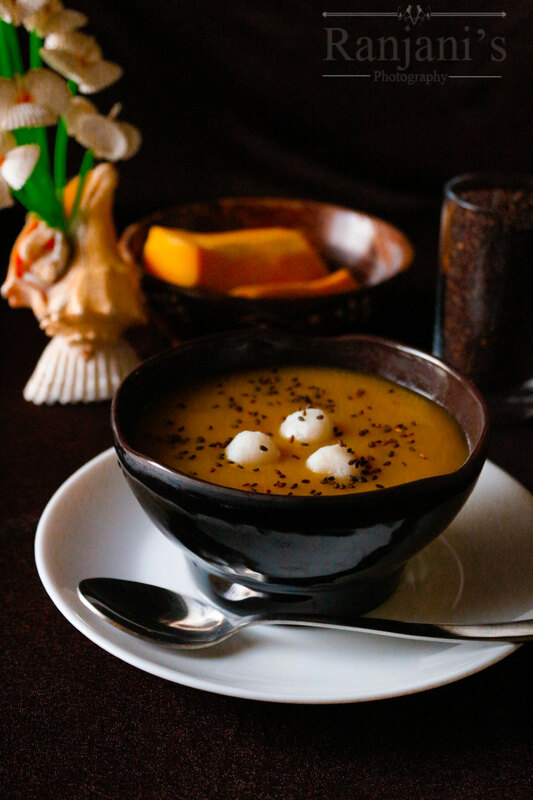 I am sure this steam hot velvety pumpkin porridge is comforting in this winter weather. In Korea, they used to prepare this for treating people who underwent surgery to reduce swelling. I added our Indian rice flour to make the rice ball dumplings and the porridge. In Korea, they used to add sweet rice flour, a flour made from short grain glutinous rice.This recipe is a baby food also. You can omit sugar to feed a baby.You can also steam cook the rice balls as we do for idiyappam in idli pot. Check out the video and stepwise pictures of how to make Korean pumpkin porridge. To make rice dumplings, in a mixing bowl, add rice flour and salt. Give it a quick mix. Then add well-boiled water slowly and knead to a smooth dough. Pinch a small portion, roll it into equal sized balls. Heat enough water to cook rice balls, once it started boiling, add the rice balls and let it cook for 2 to 3 mins until it floats on top.Drain water and place rice balls separately. In a saucepan, add enough water, add chopped pumpkin and salt. Cook until its tender and soft. Once done cool the veggie. Now grind the veggie along with 2 tbsp of brown sugar, 3 tbsp of rice flour with the water used to cook for pumpkin. Once ground to a puree consistency, pour into the saucepan and cook till it reaches porridge consistency. Turn off the flame, pour into serving bowls, topped with rice dumplings and roasted sesame or dals.